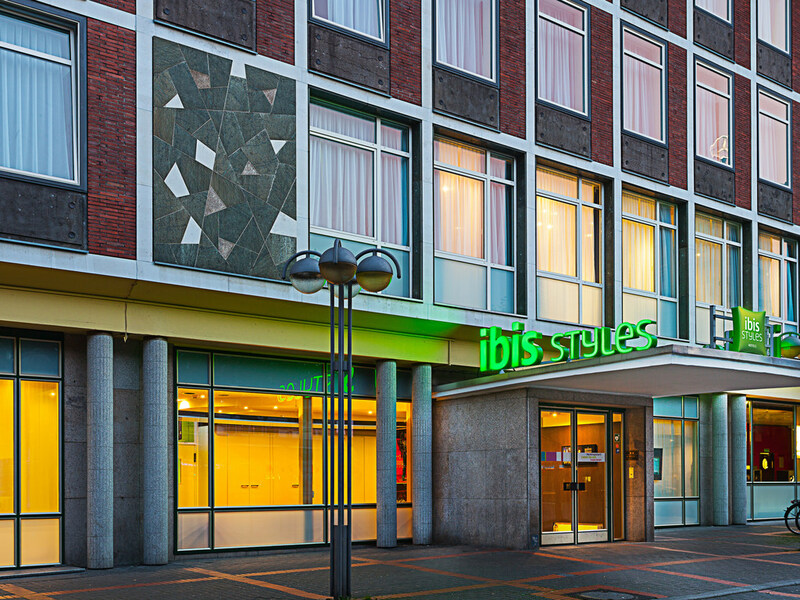 Hotel ibis Bochum Hauptbahnhof. Book your hotel now! Stayed again at this hotel within the station building of Bochum Hauptbahnhof (main railway station), so all kinds of public transport in front of the entrance. Although at a busy point the rooms are well isolated so no noise whatsoever. Friendly staff, proper rooms and facilities. Bochum lies very central with the large cities of Dortmund, Essen and Gelsenkirchen within twenty minutes. It is just a good hotel at an even better location. We were disappointed that they did not provide you with hot drinks, a kettle or water in your room. There were no subtitles on the Television so not really able to watch it. Maybe more cupboards available to accommodate clothes, accessories and footwear for 3 adults. Very fine and big rooms Nice beds and Nice with clima on the room. The staff is very helpfull and the breakfast is OK top. There were music in the town when We were There, and it was rally a great experience. I really liked the location close to many cafes, shops and entertainment. The hotel seemed newly renovated and very clean. The people at the reception were very helpful and nice! Definitely enjoyed the stay. The location is ideal being next to the station and the staff were very helpful. The rooms are a good size but the restaurant was is too small for the number of people having breakfast on each of the three mornings we were there. Location is very convenient. There are noise-canceling windows so that you do not hear the trains. Very good breakfast and very friendly service. Overall a pleasant experience. I would stay there again if I ever return to Bochum. The hotel is in a good central location and actually overlooks the main station. We had driven there and parking is down a little alley behind the hotel so not easy to find and quite difficult to manoeuvre. The room was clean and functional and it was very easy to walk into town with lots of restaurants and cafes nearby. There was a festival on the weekend we were there and it was quite noisy outside until the early hours of the morning. Breakfast was included but it was limited. Overall this was good value for money but I would probably stay somewhere else next time. Hard to beat the convenience of being at the Hauptbanhof, both for daily travel out to the university for a conference and being near to all the shops in the Hbf. The room had everything one needs, the hotel staff was very helpful, and the breakfast was great. Across the street begins the pedestrian streets with more shops and sights. We have stayed in a triple room. Good price with breakfast included, quality is not good as expected from Ibis styles. The room was small for three people. The bathroom and room were clean. You can use free wifi for 24 hours. Very nice hotel, decent value for money, however lift was out of use, and wasnt enough room at breakfast on the second day. But apart from that happy with stay. Sleep wasn't helped by location which was right in the city centre but to be expected from location. Very basic, noisy and poor value. I paid €80 for one night. Room was very very basic (but clean). People were very noisy, some going up and down fire escapes and talking outside my window, trains started at 6am and I could hear announcements from that time. Not good value at all in my opinion. Hotel is very used. It started in elevator. Rooms are looking to the wall or to train platform. Personal is OK, but location(Ibis is in train station building) is horrible. That was my the worst stay in Ibis of my live. Pos Spacy room, good beds, big table, large tv that I never use, free and fast wifi, renovated bathroom and free nice breafest. Very friendly staff. Cons But ist overal it is still the same IBIS Hauptbahnof with very bad heating, no bar or restaurant. IBIS Styles? Too ambicious name for this train station IBIS. good level rooms quality compare last year in september 2013 but we have a problem with the parking wich is a little too small , air conditionned is a little noising when it is working. Some people speaking french at the reception should be apprecied. That was the worst Ibis that I stayed in. It is too old, there haven`t coffee facilities, safe, LCD, I will never visit it again. The staff was good, but unfriendly and too serious. Air-condition was not working. There is another Ibis, 300 meters from this one- Ibis City Centre. It looks good and new. This stay was fine, the hotel was quiet but still next to the train station and city center. I consider it excellent value for money. Breakfast was fine, the bed was fine. Perfect stay-over location for a next-day visit to Bochum university.